Pollo Tonnato | Jake & Sam -- Let's Cook! This is the chicken version of the Piedmontese dish, vitello tonnato. It’s less trouble to make, less expensive, and some would say equally delicious. 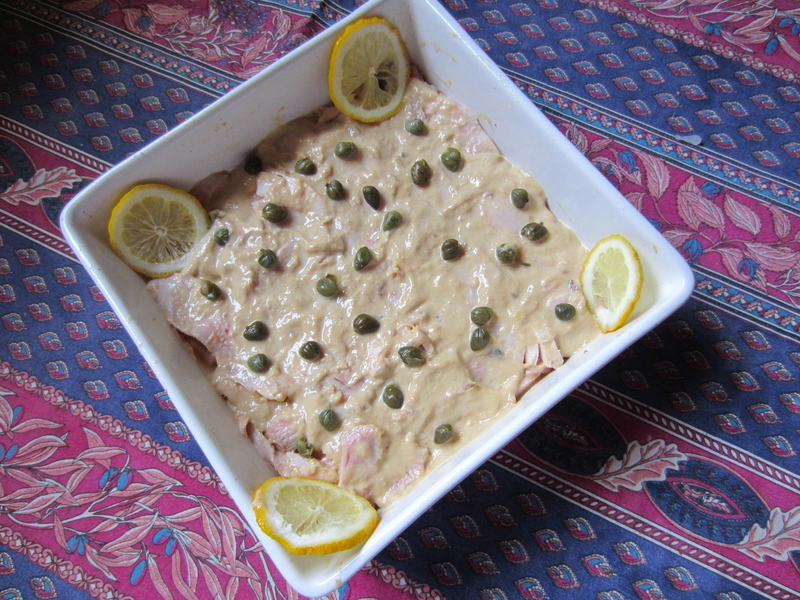 It’s best made with poached chicken breasts which are then thinly sliced and layered in a mayonnaise-like tuna sauce. In a pinch you can use a store-bought roasted chicken or – as I often do here in France – a smoked chicken, readily available at supermarkets. With a green or tomato salad and some crusty bread, it’s perfect for a summer lunch or light supper. For a larger gathering or festive occasion, it can even be made a day ahead of time, knowing that the flavors will only improve with time. In fact I think that, like vitello tonnato, it’s at its best if allowed to sit for a while so that the chicken absorbs the flavors of the sauce. Remove any fat or unpleasant bits from the chicken breasts. Heat the chicken stock to boiling point in a shallow pan that will just accommodate the chicken breasts. Add the chicken and when it comes back to the boil, turn down the heat and simmer the chicken very gently for two minutes. Turn the chicken breasts over, turn off the heat, cover the pan and let the chicken rest for a further 5 minutes. Check that it’s cooked by cutting into a piece or by pressing it with your finger tips. If it doesn’t give at all, it’s cooked. Drain the chicken, saving the stock. Slice the chicken crosswise into thin slices (5-6 to each breast). It doesn’t matter if the slices aren’t perfect – no one will know when you layer it. Put the tuna and anchovies in a food processor and reduce to a thick puree. You can add the oil from the tuna can if it’s good quality. Add the mayonnaise, then the oil and the lemon juice. You want it to be a thick but pourable sauce; so you’ll need to thin it with a couple of tablespoons of the chicken stock. Taste for seasoning – you can add some pepper, but won’t need much salt (maybe even none) because of the anchovies. On a deep platter that will take all the chicken, spoon a few tablespoons of the sauce and spread it around. Cover with a layer of chicken. Spread enough tonnato on the chicken to cover it. Sprinkle with some of the capers. Continue to layer the chicken and tonnato, ending up with a layer of tonnato. Sprinkle with the rest of the capers and decorate with lemon slices. Refrigerate the dish for at least 3 hours, preferably overnight, making sure you remove it from the fridge at least an hour before consuming it. You may have some tonnato left over — it’s especially delicious with hard-boiled eggs or sliced tomatoes.